Music has always been big business but with the popularity of services like Pandora, Spotify, MOG, and any number of other music streaming services the competition is a lot tougher than it use to be. 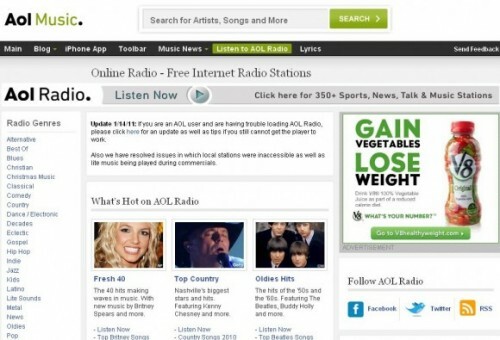 Perennial web giant wannabe AOL doesn’t want to miss out on that business it seems either as they announced today that they are back in the music game with a revamped music navigation system and with a lot less advertising. While AOL actually uses Slacker Inc to provide the actual music and advertising for their branded service AOL has said that in contrast to past advertising policy they will now only insert 3 minutes of audio ads in every one hour block. AOL lost 1.9 percent to $14.08 today in New York trading. The shares have dropped 41 percent this year. The new features, reduction in ads and redesigned music navigation are aimed at reversing a 25 percent drop in AOL Radio users from a year ago, Namerow said. The service averages about 3 million users a month, she said. AOL Radio, which carries ESPN Radio and ABC News stations, has 230 music channels customized by a team of program directors, while competitors rely on computer algorithms, Namerow said. The only problem I see with this is … I didn’t even realize that AOL had a music service, let alone that they were rebooting it.